This is a copy of a paper published in The Southern Sociologist, Newsletter of the Southern Sociological Society, 36(3):12-15, Winter 2005. Also available in pdf format. Please cite as: Deflem, Mathieu. 2005. 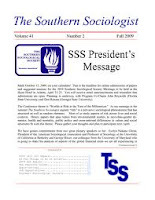 “Southernizing Social Forces.” The Southern Sociologist, Newsletter of the Southern Sociological Society, 36(3):12-15. I wish to alert fellow SSS members of a recent development in the editorial handling of the journal Social Forces to offer some food for thought which I hope will stimulate discussion and action by the Society’s members and, possibly, the Society’s leadership. The policies at Social Forces (SF) are relevant to the SSS because the Society is rather intimately connected with the journal. SSS members receive a cut-rate subscription to the journal, and the Editor of Social Forces serves ex-officio on the SSS Publications Committee. Also, “by custom dating back to the early 1970s, the Editorial Board consists of all Chapel Hill sociology faculty members and of other sociologists located elsewhere. At least half of the non-Chapel Hill members are always members of SSS” (SF report 2003). The SSS homepage even mentions the journal as “the official journal of the society,” although that is less than accurate (SSS Homepage). Since the recent editorial hand-over of Social Forces from Richard Simpson to Judith Blau, the journal contains a separate section called “Public Sociologies”. SSS members were first informed of the move to include such a separate section in SF when Editor Blau informed us that the June 2004 debate on public sociology featuring Michael Burawoy, François Nielsen, David Brady, and Charles Tittle (SF Vol. 82, pp. 1602-1644) had “elicited only favorable comments” and that the debate would be continued “as Public Sociology, with a really terrific 2 papers in the next issue” (email by Judith Blau to SSSnet, May 15, 2004). A message on the SF homepage announces that the series will be a continuing one, with each issue of the journal including “10-14 articles, book reviews, and special pieces in a section titled Public Sociologies”. In the September 2004 issue of Social Forces, the first set of these ‘Public Sociologies’ papers has appeared (Vol. 83, pp. 391-421). The papers are also available online via the SF homepage along with a discussion board for comments. There are at least two reasons why I question the editorial policy to include a separate public sociologies section in SF. The exclusive inclusion of public sociology in the space of a general sociology journal is objectionable on substantive grounds. As readers of this newsletter —especially those who are also members of the American Sociological Association— may already know, I am a fierce critic of public sociology and any and all other attempts to bring activism into sociology (Deflem 2004, a,b,c). Basically, I argue that our sociological activities are not only ill-served by an activist orientation in view of the standing of our profession, but also and more importantly that our sociological work ought to be resolutely directed at analyzing, rather than evaluating society and its various components. We are not only sociologists, but as sociologists we can only be sociological. In my mind, therefore, it is problematic for SSS to associate with a journal that is now committed to an activist agenda. There is some discussion on the precise nature and objectives of public sociology (Hausknecht 2002), but not as much as the plural form ‘sociologies’ in the new Social Forces section might suggest. Public sociologists invoke discussion, to be sure, but only within the confines of a platform that shares a basic understanding of public sociology as an attempt to connect sociology with selected matters of public debate in a way that would also allow to “challenge the world” (ASA 2004). Public sociology is a form of political activism and an attempt to redefine sociology accordingly. There are indeed indications that the public sociology for which space is reserved in Social Forces is framed within an activist understanding. On the new Social Forces homepage, it is striking that the journal is now introduced as having been founded by the “pioneering sociologist and social activist Howard Odum.” It is not to deny that Odum’s work critically inspired social action, but it is telling to describe him as such to introduce the journal he founded. The remaining silence about Odum is also striking. The holder of two Ph.D.’s, Odum also founded the Sociology Department at UNC, served as President of the ASA, and authored dozens of books and hundred of articles, most famously dealing with regionalism and folk culture in the South. An obituary in the American Sociological Review (Vol., 20, 1954), praised Odum for the fact that “[a]s a sociologist” he used “scientific methods” and avoided “to put in writing biased opinions” (p. 237). The new Social Forces Editor, Judith Blau, has had a leading role in bringing public sociology to the professional sociological arena. She was among a group of members of the advocacy group, Sociologists Without Borders, to lead a (successful) effort to have the ASA consider and eventually adopt a resolution condemning the war in Iraq. Blau (2004a) has supported her actions especially in terms of a defense of human rights. I can surely respect (even if I disagree with) any scholar’s positions and decisions, particularly when they effectively bring about intended consequences. However, I also expect scholars to respect the boundaries of the duties they undertake in the various contexts of our work, whether they be matters of teaching, research, or service. Therefore, the question can and should now be asked whether Professor Blau is acting in her editorial capacities on the basis of universalistic criteria of publishing or whether she is acting as an activist. I cannot answer that question, of course, but based on public sociologists’ own understanding of the role of the sociologist as activist, the question can legitimately be asked. That alone should give pause. Finally, most importantly in view of our Society’s association with Social Forces, it is questionable on formal grounds that a generalist sociology journal would reserve space for one special branch of sociology. Even when one would not question the value of public sociology, the fact remains that Social Forces is now a journal of which some of its limited and costly pages cannot be taken up by other work. The same critique would apply should the journal have reserved space for any other specific sociological specialty or approach. Worse yet, the public sociology papers in SF are solicited and not double-blind reviewed (Blau 2004b). Relatively speaking, peer-refereed sociology is in Social Forces losing out to invited politics. Because of my profound criticism against public sociology and my disappointment with the direction Social Forces has now taken, I have decided to cancel my subscription to the journal. I do this very reluctantly, because Social Forces is one of the finest journals in U.S. sociology. Even with the recent change in editorial policies, also, I know the journal will continue to publish good work (assuming at least that no activist orientation also affects the review process of submitted manuscripts). Nonetheless, I cannot support a journal with whose mission and practices I fundamentally disagree. I hope that fellow SSS members will ponder these developments and voice their thoughts. As a Society, there are different options for us to consider. We can appeal to our leadership and fellow members to consider terminating the Society’s association with Social Forces. I personally think that option is too drastic and costly, because we would lose association with one of the all-time great journals. Alternatively, it might be wise to exert all due pressure to have Social Forces change its course and return to the fruitful direction as a top-notch sociology journal with which the Southerners happily wish to be associated. Keeping Social Forces Southern should mean keeping it sociological. Blau, Judith. 2004a. “A Call for a Constitutional Convention.” Amici, the newsletter of the ASA Sociology of Law section, 11(2):3-5. ____. 2004b. “Editor’s Note.” Social Forces 83(1):1-2. Deflem, Mathieu. 2004a. “The War in Iraq and the Peace of San Francisco: Breaking the Code of Public Sociology.” Peace, War & Social Conflict, Newsletter of the ASA section, November issue, pp. 3-5. ____. 2004c. “There’s the ASA, But Where’s the Sociology?” Public Forum letter. Footnotes, the ASA Newsletter, July/August 2004, 32(6):9. Hausknecht, Murray. 2002. “Models of Public Sociology.” Footnotes, the ASA Newsletter, December 2002. “Social Forces Report,” submitted by Richard L. Simpson. The Southern Sociologist 35(1), p. 55, Spring/Summer 2003.